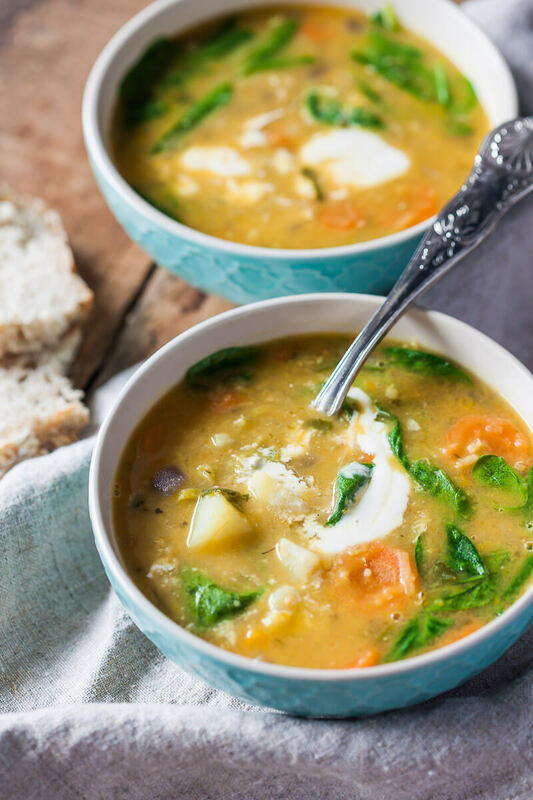 Creamy Lentil Soup is a hearty vegan one-pot soup with lentils, pumpkin, and spinach. Great for a cold winter day and ready in just 30 minutes! Gluten-free & Vegan. Peel and slice onions, slice carrots and leek, and dice potatoes. Heat a tablespoon of olive oil in a pot, then add the vegetables and cook on medium, stirring regularly, for a couple of minutes, until the vegetables turn to soften. Then, add lentils, split peas and pumpkin, and pour over with vegetable stock. Add more water if in need of liquid. Season to taste, bring to a boil, then cook on low for about 30 minutes, or until the lentils and vegetables are cooked through. Remove about half the soup from pot, and blend it with an immersion blender. Blend until smooth to your liking, then add it back to the rest of the soup and stir to combine. Finish the soup with about a tablespoon of vegan cooking cream and stir in a cup of baby spinach leaves. Taste check and if needed, season to your liking. Serve hot.